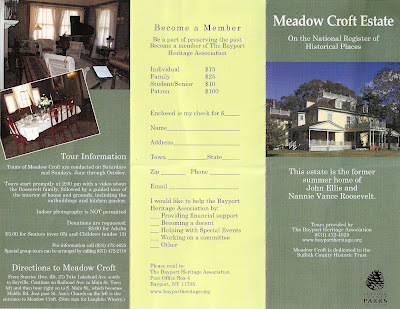 Meadow Croft is open for visitors. Tours will be Saturday and Sunday, 2 pm. The John Ellis Roosevelt Home known as Meadow Croft located at 200 Middle road in Sayville. John Ellis Roosevelt and his family escaped the summer heat of the city for the cooling breezes of Long Island. The original house was built in 1867, purchased by the Roosevelt’s in 1890 and expanded in the colonial Revival style by noted architect, Isaac Green Jr. It was owned by the Roosevelt’s for nearly a century. By the early 1980’s, the house had fallen into disrepair and was threatened with being lost. 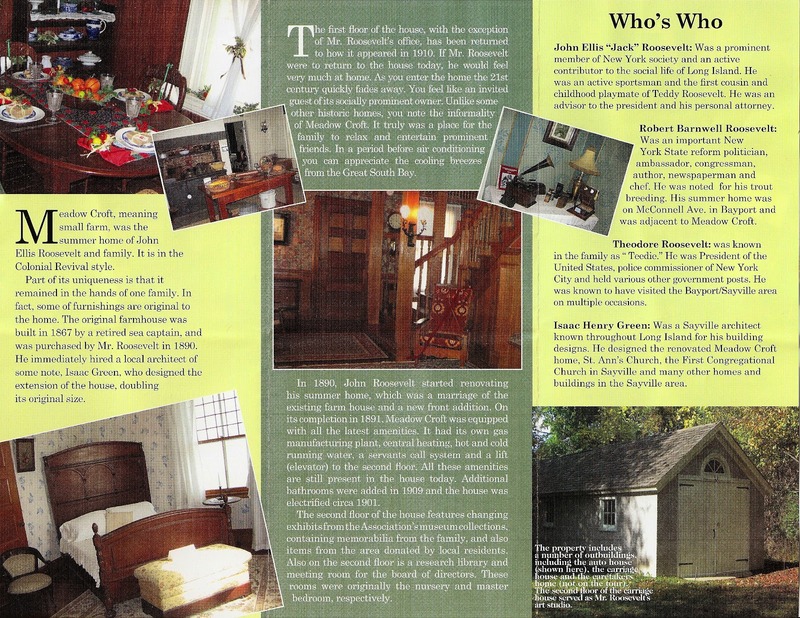 Bayport Heritage Association came to its rescue, approaching the county and creating a partnership. During the tour new exhibits include works from local artists, the auto Barn and the long awaited Carriage house. Pack a picnic lunch, take a tour, then go back and do some wine tasting at Loughlin Vineyards. on Facebook at “Bayport Heritage Association”. Directions: Long Island Expressway (Route 495) to Exit 62 South (Nicolls Road.) At end, turn right onto Montauk Highway (Route 27A). Go about one mile and at Amoco Gas Station, turn left onto McConnell Ave. Go to end, make right onto Middle Road. Entrance is on the right. Click on the images below to see the booklet larger for more information.